Abhishek was told Aaradhya "not having a normal childhood"
One of the reasons behind Abhishek Bachchan's high coolness quotient is the way he deals with trolls. Abhishek is known to have never shied away from confronting social media trolls, especially with sarcasm. 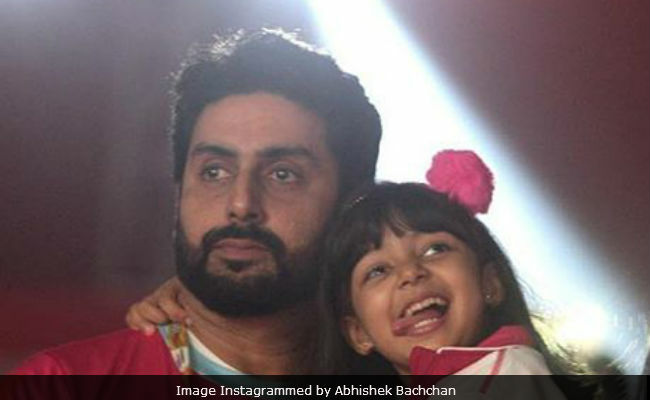 Something similar happened earlier this week, when a Twitter user (who seems to have made her profile private now) had something to say about Abhishek's daughter Aaradhya, who celebrated her sixth birthday last month. Well, well, well... what the user didn't know was that she was treading on rough waters, because Abhishek has a history of schooling trolls and had tweeted a disclaimer two years ago that: "Bringing my daughter into it is NOT cool." In a tweet, which has now been deleted, a Twitter user with the handle '@shirjahan' appeared to make a reference to the Aaradhya's recent appearance with mom Aishwarya Rai Bachchan at a wedding in Mangalore, pictures from which went crazy viral earlier this week - the mother-daughter duo were colour coordinated in red lehengas. Referring to Aishwarya as "an arrogant woman", the user wrote: "@juniorbachchan, is ur child not going to school? I do wonder What school gives permission to take a out a kid when u like to go a a trip with mom. Or are u guys going for beauty without brains. Always hand in hand with a arrogant mom. Not having a normal childhood." Abhishek was quick to spot the tweet and responded in typically Abhishek fashion: "Ma'am, as far as I know... Most schools are shut for the week-end. She goes to school on the weekdays. Maybe you should try it considering you(r) spelling in your tweet." Ma'am, as far as I know... Most schools are shut for the week-end. She goes to school on the weekdays. Maybe you should try it considering you spelling in your tweet. Abhishek's reply seems to have calmed the troll down a bit, who then had some 'advice' for the star couple in a tweet, which is also deleted. "Maybe u guys should post some pictures of her as normal kid and not one always hanging on her mom's arm," she wrote. The Bachchans were spotted at quite a few weddings in November, which also happens to be Aaradhya's birthday month. She celebrated her sixth birthday with a grand party and guests like Shah Rukh Khan's son AbRam and Aamir Khan's son Azad. Before and after her birthday festivities, Aaradhya attended wedding functions with her parents - a video of her doing bhangra with Aishwarya was being shared on social media and she was also the star of a family wedding which the Bachchans attended together. Abhishek and Aishwarya married in 2007 and Aaradhya was born in November 2011. Aaradhya is often spotted with her celebrity mother at get-togethers and day outings. Aaradhya has also been accompanying Aishwarya to the Cannes Film Festival since she was a baby.